The Welsh Springer is described in the breed standard as a very ancient & distinctive breed of pure origin. Spaniels are considered one of the oldest dogs known to man. They appear to have been in Europe for centuries & are thought to have originated in Spain ~ arriving in England possibly in the 'Dark Ages'. The breed's coat ONLY comes in a single colour combination of white with red markings. Welshies are wary of strangers at first, & can have a 'reserved' nature. They are however VERY loyal to their owners. They are a serious working dog, bred for hunting, & while not as rare as some varieties of spaniel, they are rarer than the more widely known English Springer Spaniel with which they are sometimes confused. The actual date of origin of the Welsh Springer Spaniel is in fact so ancient, it cannot be traced, however dogs resembling the breed with its distinctive red & white coat are frequently depicted in old pictures and prints. John Caius, writing in 1570 said "Spaniels whose skynnes are white and if marked with any spottes they are commonly red". It is thought that these Spaniels made their way into the Welsh valleys where local sportsman & hunters managed to conserve them in a pure state. * (Cited in: Ireland, Stanley (2008). "Chapter 15: Government, Commerce and Society". Roman Britain: A Sourcebook. Routledge Sourcebooks for the Ancient World (3rd ed.). Taylor & Francis. p. 216, §507). At one time called the 'Welsh Starter', they were, & still are, used to spring game, originally for hunters using falcons as gun's had not yet been invented. The traditional red & white colour of the Welsh Springer was once also found in English dogs, but by the early 20th century any such dogs were considered to have "died out long ago". 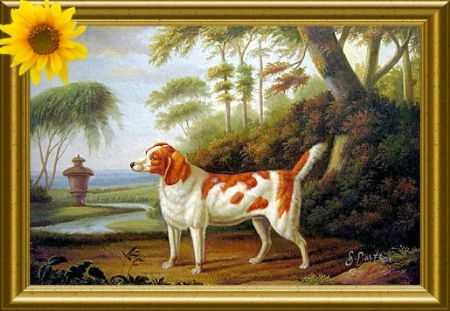 The Welsh Springer was also at one time called simply the 'Welsh Spaniel', & at one point were included in the Kennel Club UK studbook as the 'Welsh Cocker'. During the 19th century there were several different varieties of 'Cocker Spaniel', including the 'English', the 'Welsh' & the 'Devonshire' as the term was used to describe the size of the dog rather than the breed. Unusually, in John George Wood's 1865 book 'The Illustrated Natural History' an image is described showing a 'Welsh Cocker Spaniel' as a solid coloured dark spaniel. The same inscription is used in the 1867 work 'The Dog in Health & Disease' by Stonehenge and he further describes the 'Welsh Cocker' & the 'Devonshire Cocker' as "both being of a deep-liver colour". The Welsh Springer was relatively unknown during the 19th Century, but this changed in 1900 when Mr. A. T. Williams of Ynis-y-Gerwn won the team stake at the 'Sporting Spaniel Club Trials'. The trials were held on Mr. Williams' own estate, & it was thought that when his team defeated 8 well known teams it was because of the home advantage. This was disproved when dogs from the same kennel went on to win in successive years around the UK. His conformation show champion dog 'Ch. Corrin' was the first Welsh Springer Spaniel to be photographed. Welsh Springers were recognised by 'The Kennel Club' after the breed had gained popularity in 1902 under the new name of 'Welsh Springer Spaniel'. Until then the breed was actually shown alongside the English Springer Spaniel. The Welsh Springer Spaniel was transported to America in the late 19th century & finally gained recognition by the 'American Kennel Club' in 1906. World War I caused huge problems for the breed in the United Kingdom, & when the war was over there were no dogs whose parents had registered pedigrees. The breed restarted with the remaining unregistered dogs, & it is these that formed the modern day breed. 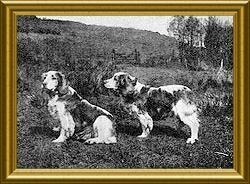 The breeders in the 1920's & 1930's developed these dogs into the type of Welsh Springer Spaniel that remains today. The Welsh Springer Spaniel Club (UK) was formed in 1923 & registrations slowly increased between the wars, but unfortunately, all records held by the breed club were destroyed in an air raid during World War II. Following the World Wars, it was thought that no Welsh Springers remained in the United States of America. The breed was reintroduced & the descendants of those dogs make up the breed today in both the USA & Canada. In 2000, 'The Kennel Club' (UK) only registered 424 Welsh Springer Spaniels, compared with 12,599 English Springer Spaniels & 13,445 English Cocker Spaniels. Numbers remained steady, with 420 Welsh Springer Spaniels being registered in 2004, however numbers of English Springer Spaniels increased to 14,765 & English Cocker Spaniels to 16,608. Numbers however, remained closer to the 'American Cocker Spaniel' which registered 610 in 2000, & 599 in 2004. The breed however, continues to remain slightly more popular than some other breeds of Spaniel, including the Clumber Spaniel, Field Spaniel, Sussex Spaniel & Irish Water Spaniel.